Looking for a comprehensive checklist on how to start homeschooling? Well, you have come to the right place. Making the decision to homeschool your kids is a HUGE decision and I want to help you get started on the right foot. I have been in your shoes and I totally get that trying something new is overwhelming. This checklist will guide you through the steps of starting to homeschool and calm the overwhelm. Start your homeschooling adventure now by downloading your FREE New Homeschool Checklist! After you download your checklist be sure and keep reading, or pin for later, for additional help for completing your checklist. Once you check the last box, you will be prepared and ready to dive in head first. Do you know your state’s requirements for homeschooling? Every state is unique, so go find out now. Simply visit the Coalition for Responsible Homeschool Education Group’s Homeschool Laws By State Map, then identify and document your state’s regulations. Notice Only: These states require notice of intent to homeschool only. Assessment w/ Exceptions: These states require assessments but have various exceptions. Moderate Assessment: These states have assessments with lax thresholds for intervention. Thorough Assessment: These states require assessments combined with other provisions. To avoid complications down the road, get educated to comply with your state guidelines. The last thing you need, or even want, is a truancy officer knocking on your door because your son or daughter did not show up for school! This is a step that can often be overlooked when researching how to start homeschooling. But I can’t emphasize this one enough. Setting your goals will not only set your homeschool tone but also help you filter out the seemingly endless amount of homeschool options. At the end of the day when all is said and done, what do you want to achieve from educating your kids at home? on the days that your child does not want to learn? when you don’t think you can explain 2+2 for the 5th time? during the times when the laundry is piled up, the house is a mess, and you desperately need to go to the grocery store? If not, maybe there is another motivating factor that you need to consider in your goals. If you are new to homeschooling, you may be wondering what a homeschooling style is. Simply put, it is the method by which you choose to teach your kids at home. So what defines a homeschooling style? Determine which homeschool styles you relate to and that align with your goals. This will help you decide what curriculums and schedules will be ideal for you and your kids. It is OKAY to want to incorporate aspects of multiple styles if you feel drawn to them. So many homeschooling families do not fit into just one style box. How much money do you want to invest in a curriculum? Does your state have requirements for how your homeschool should be structured? Please don’t feel like you must commit to a single style forever. Over time you may develop your own style, like our eclectic homeschool. What days of the week and months of the year do you want to plan school work? There are advantages to each type of schedule. Unless your state dictates a particular schedule, you get to decide. Finding what works for your family may end up being trial and error over the years. You don’t have to follow tradition. The majority of homeschoolers are not buying into the August to May, Monday through Friday, and 8 am to 3 pm schedule. Homeschooling year-round works best for us. I am able to schedule several short breaks throughout the year to avoid burnout. 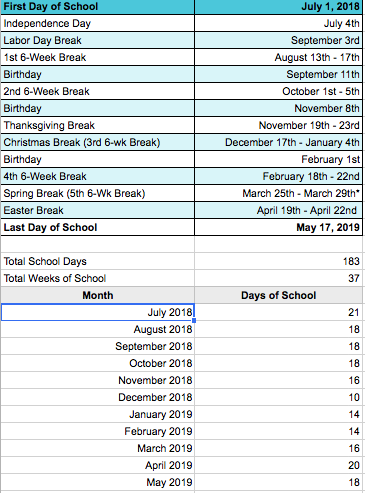 To see just how our schedule flows, check out why we homeschool year-round. Research the homeschool group options in your area. Consider if joining is a good fit for your family. Joining a homeschool group may not be a good fit for your family….. that is OKAY. If you feel that y’all will benefit from coming together with a homeschool community, see if you can try it out before making a year-long commitment. Just reach out to the leader to see if you and your kids can sit in on a session to feel things out. Either way, homeschool group or no homeschool group, check out your options and make the decision that’s right for y’all. Trust me, I learned the hard way. It is easier to plan upfront rather than scramble around when it comes time to reapply with your state. I use my Google account to store all of our homeschool documents, outside of textbooks/worktexts. Our annual calendar, curriculum details, additional supply and literature needs, and any online resource details are in a Google Sheet. The kids weekly to-do lists are in a Google Documents. In addition, I create a folder for each school year to save all relevant info in, such as state approvals or PDF printable resources. Your style and needs may be different than mine. Sharing how I manage should give you an idea of things to consider. Whatever is easy to maintain and saves you time in the short and long run is what will work best for you! Part of how to start homeschooling is deciding what subjects you want your kids to learn. Does your state require you to teach a particular list of subjects? Are there subject guidelines for the homeschool style you have chosen? What is age appropriate for your kids? What subjects support your homeschool goals? Is there a particular activity/subject that you want your kids to develop their skills in? Are there things that your kids are really interested in? Take this to heart: As a homeschooler, you can be creative when it comes to teaching your kids! This is YOUR school. If you need some help getting started on your subjects, check out the lists below. Time for shopping! Using your guidelines from items 1-8 above, you can now stock your homeschool. DON’T get lost in the sea of curriculum options. Keep your style and goals in mind. Talk with other homeschool parents. Listen to why a resource worked or didn’t work for them. Expensive is not always better. Find free or inexpensive curriculums with a little research. Check out Cathy Duffy’s 102 Top Picks for Homeschool Curriculum. A great resource including detailed descriptions of curriculums by subject. You can find some of my specific recommendations on the Live Laugh Grow resource page. Start out slow. You can always add to your curriculum list if you feel things are not challenging enough. Check out my Must-Have Homeschool Supplies list you are not sure what supplies you actually need for your homeschool. Start out simple! Really the basics- pencils and paper, will get you pretty far! Not sure where to start when it comes to planning out your upcoming homeschool year? Does your state have a required amount of instructional days for a homeschool program? If so, how many? The dates for any planned vacation time that you wouldn’t be doing schoolwork. Certain days or times of the year that you plan to break from schoolwork. The type of school schedule you intend to follow. Year-Round, Traditional, Loop, Block, etc. Other holidays that you plan to break for. Once you have noted the items above, you can prepare your very first school calendar! Below is a simple step process to finalize your calendar. Print a calendar that includes all the months that you plan to school. On the calendar, mark off the days that you will break from school. If your total days do not meet your state requirements, adjust your breaks or start/end dates. Document all of the info to create your calendar. The power of camaraderie should not be underestimated. When you encounter a really, really bad day, it is okay for everyone to take some time and regroup. During that time, find your solace in support from your spouse, encouraging words from a friend, commiserating with another homeschool parent, or just enjoying some alone time. Not only can others offer you comfort on those bad days, but you have special qualities to share with them too. Go out and find that homeschooling buddy, I promise you will need them. Simply subscribe to Live Laugh Grow now to download the How To Start Homeschooling Checklist and get started on the right path for your new homeschool. Don’t forget to pin this article so you can come back for guidance when you are completing each of your checklist items! Be sure and let me know how starting your homeschool is going and what type of homeschoolers you plan to be. I would love to hear from you!